But instead I tried the Singapore Style Mai Fan Noodles on the Gourmet Menu , which is my standard benchmark entree dish for comparing Chinese restaurants. Great Wall offers a vegetarian version of this dish which had an awesome, smoky Wok Hei flavor, but unexpectedly wasn’t prepared with any curry powder and included a couple of stray little shrimp – so, not so much vegetarian. 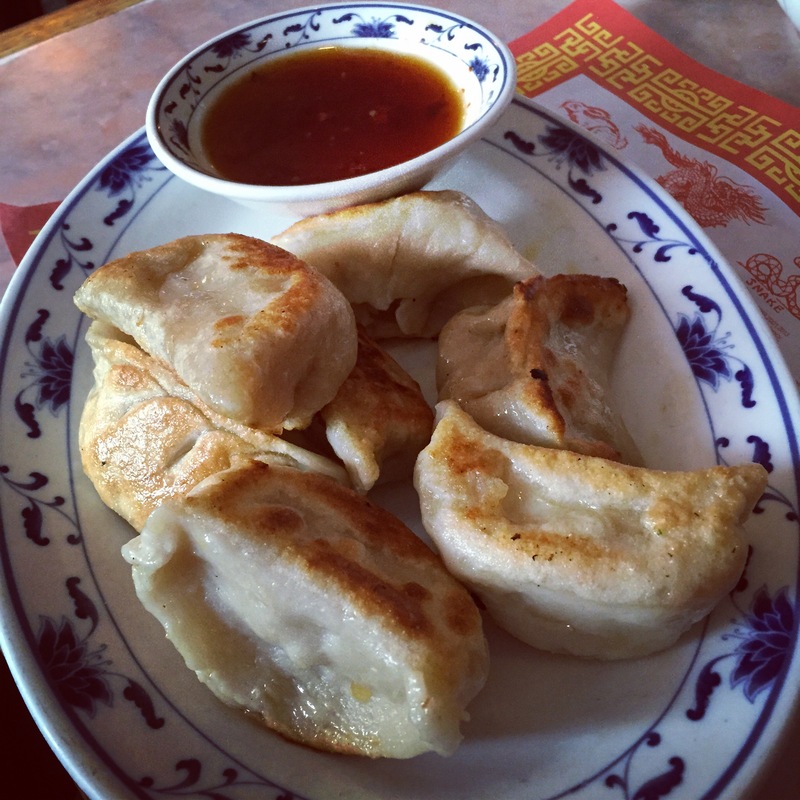 The Dumplings: The Standard Menu includes steamed or pan-fried pork dumplings and steamed or pan-fried vegetable dumplings and the Gourmet Menu additionally has the Chef’s Special Dumplings, which are filled with shrimp and chicken and come steamed and pan-fried. Pan-fried Pork Dumplings – these dumplings were a pretty standard Chinese style pork dumpling, but well seasoned and fairly juicy. The dumplings were large and the wrappers were quite thick and doughy and a single order of these dumplings was really filling. I would not go to Great Wall just for these dumplings, but they are worth getting as a starter to share before eating something from the Gourmet Menu. Pan-fried Vegetable Dumplings – The waitress told me the vegetable dumplings are house made (I assume this is true for the pork ones too) and that the filling varies seasonally. The ones I tried were filled with carrots, onions, cabbage, peas and greens and were wrapped in a green spinach dough wrapper. 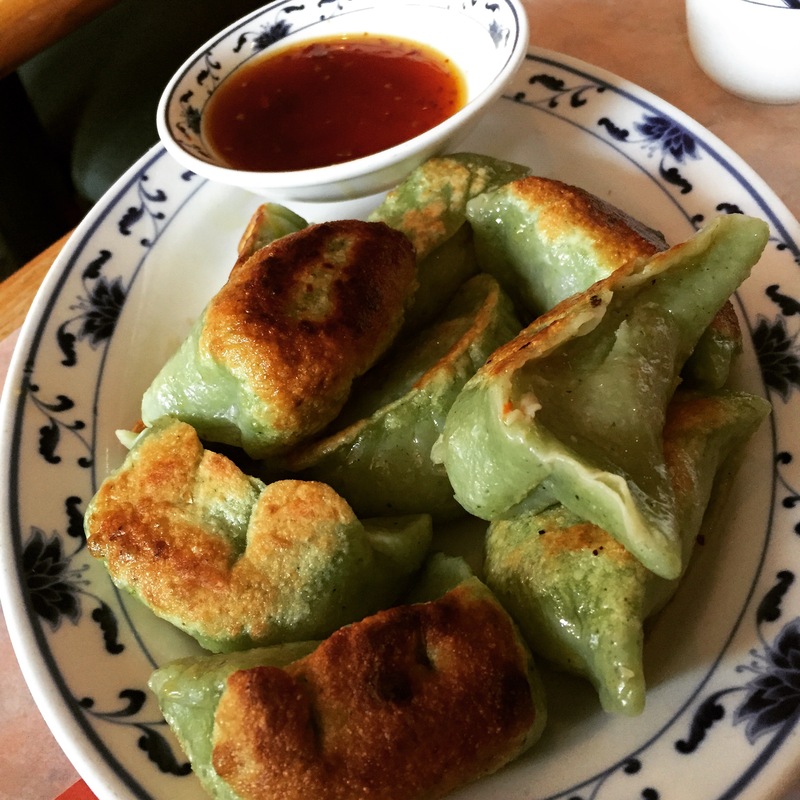 While I love pork, I liked these dumplings better than the pork ones – within the genre of vegetable dumplings these were a very good veggie dumpling, in fact a better example of a vegetable dumpling, than the pork dumplings were an example of pork dumplings. The vegetables were fresh tasting and had crunch and texture, but the wrapper was a little too sweet. The dough wrappers on these dumplings were also pretty thick and, so again, this was a filling order of dumplings. The Dipping Sauce: Great Wall serves an enjoyable, slightly sweet, soy and vinegar based dipping sauce with some chili pepper in it and maybe ginger. The Location: The Great Wall Chinese Restaurant is located in Western Massachusetts, in the town of Florence, in a strip mall – pretty much a classic location for a small mom and pop Chinese restaurant. Don’t let the strip mall location fool you, some great Asian restaurants are inconspicuously located in strip malls. It is at 178 Pine Street in the Florence Mini Mall, opposite the Arts & Industry building. This entry was posted in Chinese, Dim Sum, Pan Fried, Pork, Vegetarian. Bookmark the permalink.